Summer is approaching and the hot months, and with them the crowded ice cream making slushies, sodas and ice creams of all kinds. 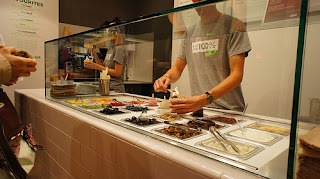 In recent years it has become fashionable to frozen yogurt, frozen yogurt instantly fact that you can add different ingredients called toppings. Looking at the frozen yogurt can say that it is a healthy food that could be taken several times a week without fear of losing the figure we have been working throughout the year. 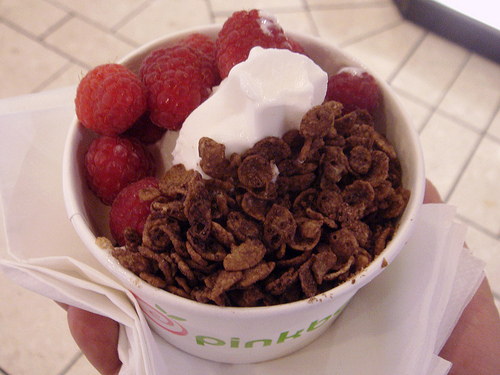 The problem comes when we add some toppings to sweeten our yogurt. If we compare with traditional ice cream, frozen yogurt is lower in fat and calories, as a rule, tend to use milk based yogurts. Because they are manufactured from milk and yogurt is a food rich in calcium. One of the most prominent features in different yogurt placess is that it is a probiotic food, helping us balance our intestinal flora, which will improve digestion and strengthen the immune system. The problem comes when we see behind the counter a number of ingredients to add to our frozen yogurt. That's when you have to be careful with toppings. We have from time chopped fruit (strawberries, melon, watermelon, peach ...) of nuts, cookies or syrups of different flavors. If we choose the option of seasonal fruit will be contributing to our Yogurt vitamins, minerals, water and fiber, making it a very healthy food. However, if we opt for unsweetened yogurt with any kind of syrup and biscuits will be contributing to our body a large number of calories as sugar. Another healthy option, although quite caloric, is added as toppings nuts (hazelnuts, walnuts, almonds ...). Thanks to the energy of nuts could include, once, a small frozen yogurt with a handful of nuts for before a workout.